The other day I slipped across the street to check the ‘Better Late Than Never’ garden – ostensibly to check new transplants for water. Really, though, I wanted to see if the butterflies were still there. Now, not just any butterflies (Though I admit I’m partial to them all.) 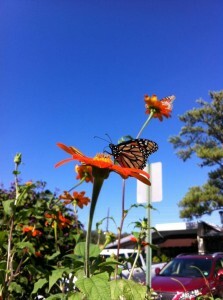 but the imperiled monarch butterflies, who, I was told, are coming through now on their migratory paths. 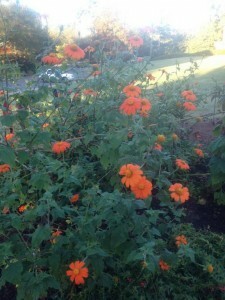 And they were still there, sailing through and landing on the Tithonia rotundifolia ‘Torch’, (Mexican sunflower) feeding on the bright orange blooms. I’m doubly glad now that I left it standing while it was still in full color. I’ve been planting the winter garden under cover of its thickened stems, fully weighted down with its nectar filled flowers. Whether these monarchs spotted the tithonia as they were coming through, or were a result of the butterfly weed Asclepias tuberosa, is anyone’s guess. Butterfly weed and milkweed are the plants that monarch butterflies lay their eggs on – the caterpillars then eat the foliage, form their chrysalis and hatch to become the beautiful butterflies I was watching soar through the garden. I called out to a mother and her young son about to get into their car. “Do you see the butterflies? They’re monarchs!” Oh my goodness!”, she answered. “Look at all of them!” Her little boy stood, transfixed, watching them maneuver gracefully through the garden. I told him how special these butterflies are, and that since they’re on a long journey to Mexico, it’s very important that they find the flower nectar to give them strength and energy so they’ll be able to fly such a great distance. 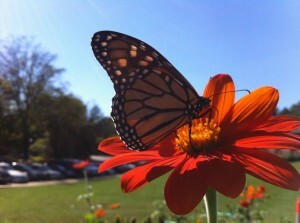 If you want a butterfly friendly garden too, provide sources of food, (They love zinnias, cosmos, marigolds, and tithonia, to name a few.) and plants they can lay their eggs on. (And that you will allow to get chewed up by the caterpillars!) These include the asclepias mentioned above for monarchs. Parsley, dill and fennel are commonly planted for swallowtails. 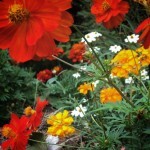 Provide pesticide free plantings, and cultivate a tolerance for the less than perfect garden. Learn to live with leaves that have been munched – more often than not, the culprits causing the problems are simply moving through your garden on their way somewhere else! Simple things like grooming plants by removing yellowed and chewed leaves, and practicing good garden sanitation by keeping fallen leaves and other plant debris out of the garden, will go a long way toward creating a healthy environment for your garden, you, and the creatures that inhabit its space. 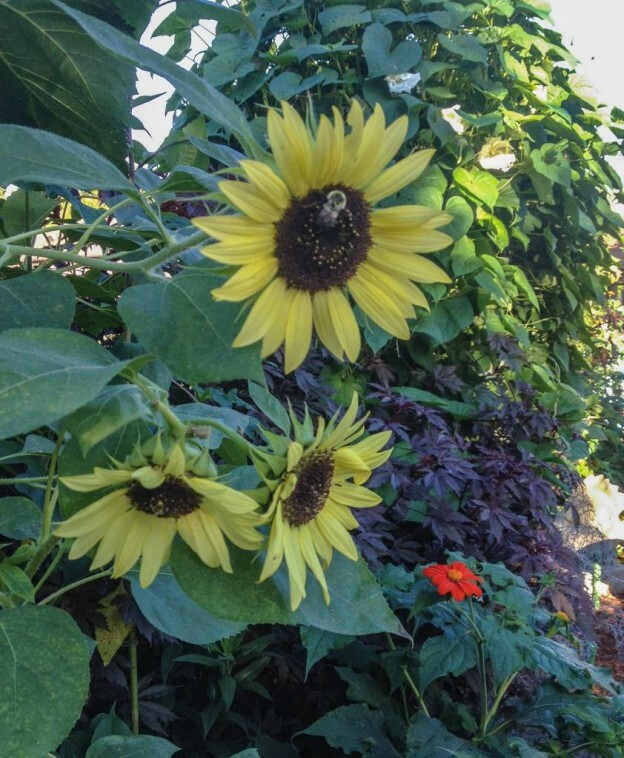 This entry was posted in Annuals, community garden, Fall, Flowers, Planting Tips and tagged attracting butterflies, better late than never garden, butterfly gardening, flowers for butterflies, milkweed, monarch butterfly on October 22, 2014 by Kris Blevons.